MICHELE watches are an exemplary example of the centuries-old craft of watch making. The designer line of women's watches follow in the tradition of their beginnings dating back to the 1940s. Each watch is created with only the finest of materials, and each features the red crown for which the brand is known. Ladies select from quality stainless steel to gold and then create her unique style and elegance to her timepiece. 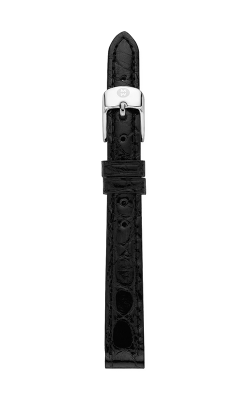 The straps of every watch are interchangeable for an array of inspiring fashions. Women enjoy the variety of options available by changing the straps from one desiigner look to another. 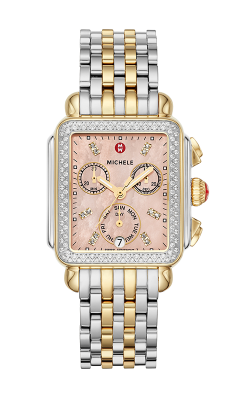 MICHELE watches come in several distinctive bold yet strikingly feminine styles. Today's woman wants a watch that does more than keeps time. She demands a timepiece that is individually hers. It will allow her to express herself as passionately as she lives her life. She expects her watch to bejewel her wrist with unspoken style. The Deco is the timeless signature piece of the line. It features a diamond setting with the distinguishable signature MW pattern. The popular Serein is elegantly feminine in style and delights its owner with brilliant diamonds. Women can also choose to add the Deco Sport to their wardrobe of MICHELE Watches. Its distinctive style delivers a sportier look than does its namesake and plays an important role in her active lifestyle. The distinctive curves and lines of a MICHELE watch create a perfect blend of luxury and functionality. The Sidney adds a touch of style and versatility to a woman's watch collection. It features the bold look of a round case with rounded lugs, and it is an undeniably fashion forward statement. For the woman who wants all of this and more from her watch, the luxury line also features the technologically advanced Hybrid Smartwatch. Why Shop for MICHELE Watches at Safa Jewelers? Safa Jewelers in Edison, New Jersey proudly features the full line of MICHELE watches. They are located in the Menlo Park Mall in Middlesex County. The store caters to its loyal clientele in the entire tri-state area, and their showroom features the finest in luxury lines of jewelry, watches, and bridal sets. Safa Jewelers offers 0% financing options. They are open daily, and they serve Edison and its surrounding communities, as well as all of New Jersey, New York City, Staten Island, Philadelphia, and Connecticut. Please stop by today to browse our jewelry showroom.